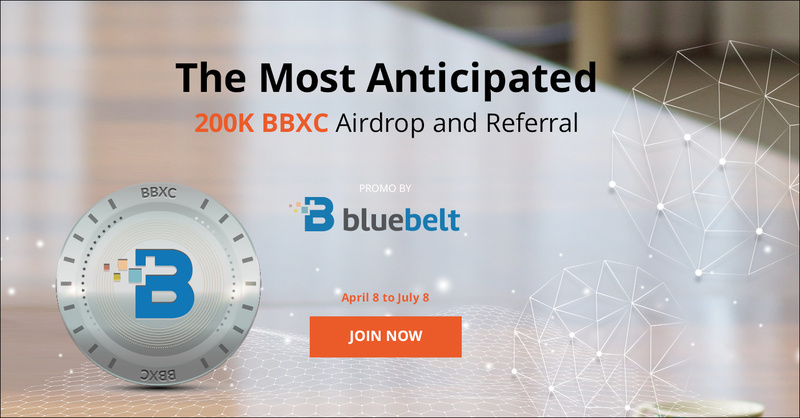 Bluebelt Launches The Most Anticipated 200K BBXC Airdrop and Referral Contest! HomeCompany NewsBluebelt Launches The Most Anticipated 200K BBXC Airdrop and Referral Contest! Today, we are pleased to announce the launching of the new 200K BBXC Airdrop and Referral Contest as a way of showing our gratitude to the continuous support of our community. Participant of the Airdrop and Referral Contest will get a chance to receive more free tokens and free trading privilege by simply signing up and referring friends. Check out what’s awaiting upon joining 200K BBXC Airdrop and Referral Contest! a. Refer your friends and get more BBXC for every successful referral. c. Referred Users must be Verified. Top 5 Referrers Get Free Trading & More! – 1st: Zero trading fee on Exchange for 2 months + Free 50 USD on Margin Trade + Use Instant Buy/Sell service with 20% Bonus (Max bonus is $200). – 2nd: Zero trading fee on Exchange for 1 month + Free 25 USD on Margin Trade + Use Instant Buy/Sell service with 10% Bonus (Max bonus is $200). – 3rd to 5th: Zero trading fee on Exchange for 1 month. BBXC is the official token of the Bluebelt Exchange. It can be used to pay for fees at a discounted price. Bluebelt Exchange is working to become the widest crypto exchange network in the world. It offers crypto pairings with local fiat currencies including USD, AUD, IDR, VND, and others. The 200K BBXC Airdrop and Referral Contest runs from Monday, April 8 (8:00 PM GMT+9) to Monday, July 8 (8:00 PM GMT+9). All BBXC token amount will be credited to your accounts 3 days after the promotion ends, by July 11 (8:00 PM GMT+9). You can start trading ASAP. To stay updated on this Campaign and other developments we invite you to get involved by joining one of our social media channels. More information and direct links can be found below.